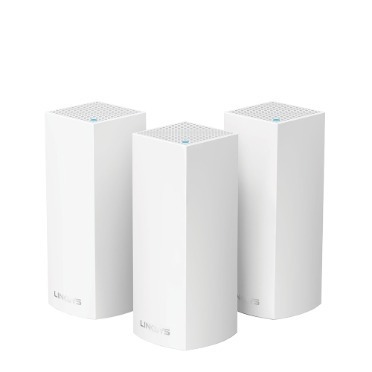 One mesh product, the Linksys Velop. EasyMesh-compatible routers will be able to monitor conditions and adapt as needed, providing a single seamless network, the Wi-Fi Alliance said on Monday. It added that owners will not only be able to use routers from multiple vendors, but match anything already EasyMesh-ready with future hardware. The Alliance didn't immediately identify routers or manufacturers that would support the standard. There are relatively few mesh options on the market. The forerunners are typically considered to be Eero, Linksys Velop, Netgear Orbi, Google WiFi, and Ubiquity AmpliFi HD. Mesh routers provide better coverage than their counterparts by using one or more satellites. While similar in concept to extenders, mesh systems don't require the creation of multiple SSIDs, and will automatically shuttle devices between the best possible connection points. Some models may have dedicated backhaul bands to ensure maximum speeds. Apple recently discontinued its AirPort line, and began selling the Velop as an alternative.